Nicole Foss comes to Guildford! We’re co-hosting a special event on the 9th of March, with an international guest speaker! 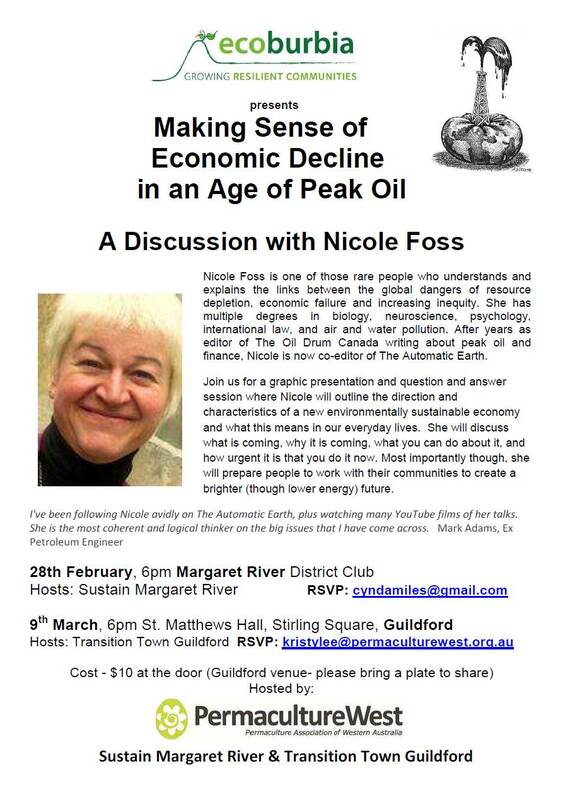 Transition Town Guildford in partnership with Permaculturewest & Ecoburbia are pleased to host Nicole Foss, as part of her Australia and New Zealand tour, “Making Sense of Economic Decline in an Age of Peak Oil”. After years of writing about peak oil and finance as editor of The Oil Drum, Ms Foss is now co-editor of The Automatic Earth. Ms Foss is academically well qualified, with multiple degrees in biology, neuroscience, psychology, international law, and air and water pollution. On this tour Nicole will be talking about what’s coming, why it’s coming, what we can do about it and why it’s so vital to act now. Most importantly though, she will prepare people to work with their communities to create a brighter (though lower energy) future. Put it in your diary, we hope you can make it! This entry was posted in Climate Change, Economics, Event, Peak Oil and tagged Economic decline. Bookmark the permalink.